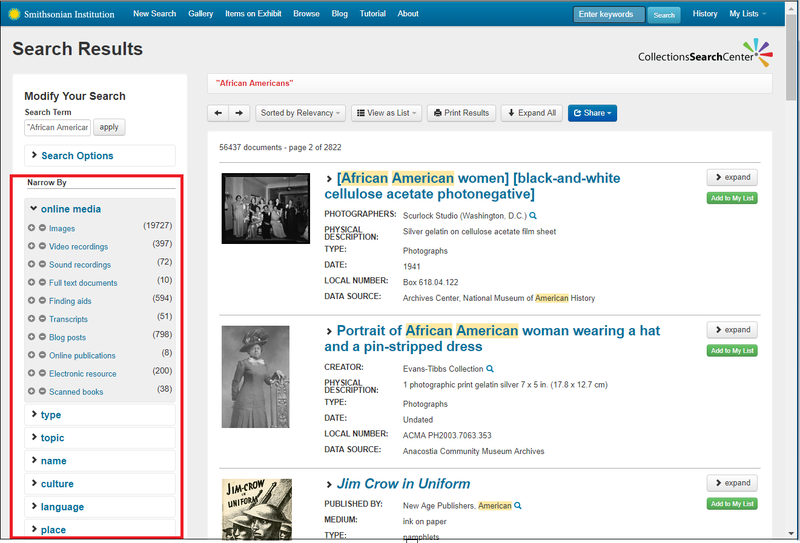 The Collections Search Center provides easy "one-stop searching" of more than 13.5 million of the Smithsonian's museum, archives, library and research holdings and collections. 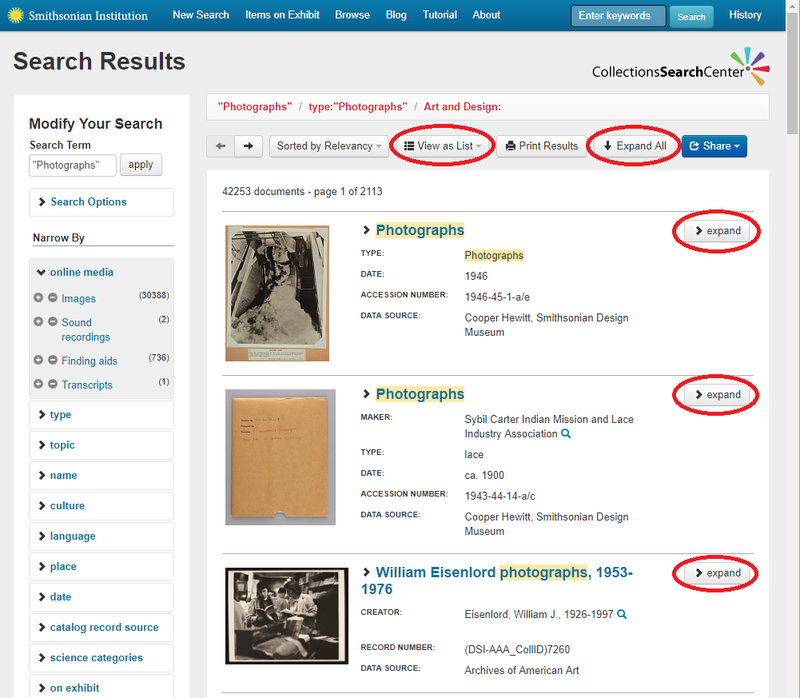 The access to more Smithsonian collections via this Search Center is increasing over time. The Smithsonian Collections Search Center is mobile-aware. Users visiting the site with their iPhone or Android devices should automatically be redirected to a mobile friendly version of the site while users of PCs, Macs, and iPads receive the fully formatted pages. 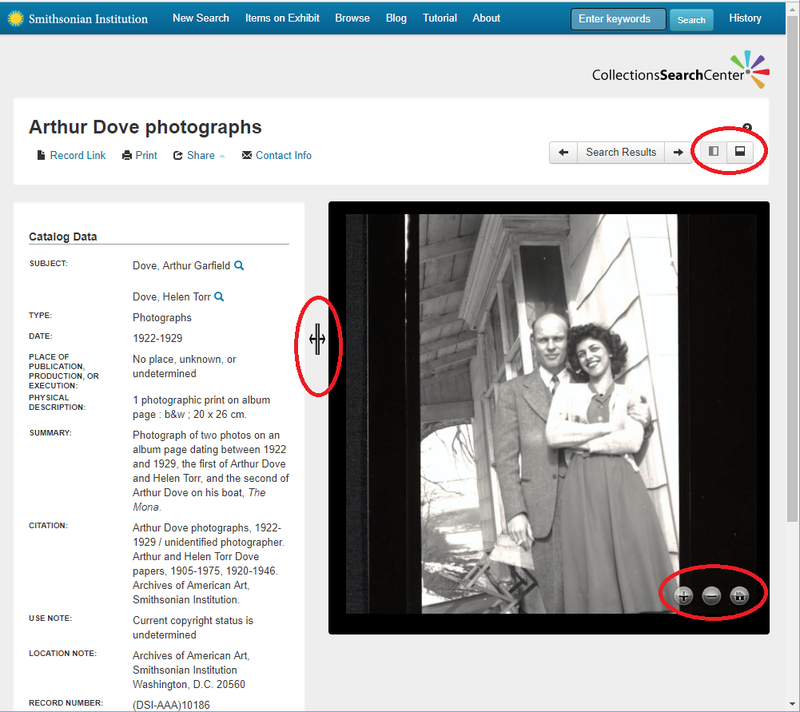 Contents in this search center are mostly brief catalog records describing the Smithsonian's permanent collection of objects and materials, as well as images, audio, videos, blogs, and other born-digital content. Search terms should include KEY words or short phrases. Try to avoid using terms such as: of, in, during, with, by, the, collection, object, item, image, photo, culture, people, antique, history, etc. For Cherokee culture items, use Cherokee. For Lenin during the Bolshevik Revolution, use Lenin Bolshevik Revolution. For paintings by Alexander Calder, use Calder Alexander paintings. For image of Thomas Mahone, use "Mahone, Thomas" or "Mahone Thomas"
Use quotation marks to ensure words are in exact order. Use a "+" in front of each word to ensure the search terms MUST BE matched. Use a "-" in front of each word to ensure the search terms MUST BE excluded. Names are often cataloged in Last name, First name order. Try to search in this order first. There is an auto-suggest function based on your search term. You can also search names with quotation marks for tighter search results. For George Washington, use "Washington, George" or "George Washington"
For William H. Johnson, use "Johnson, William" . "William Johnson" will not find "William H. Johnson". 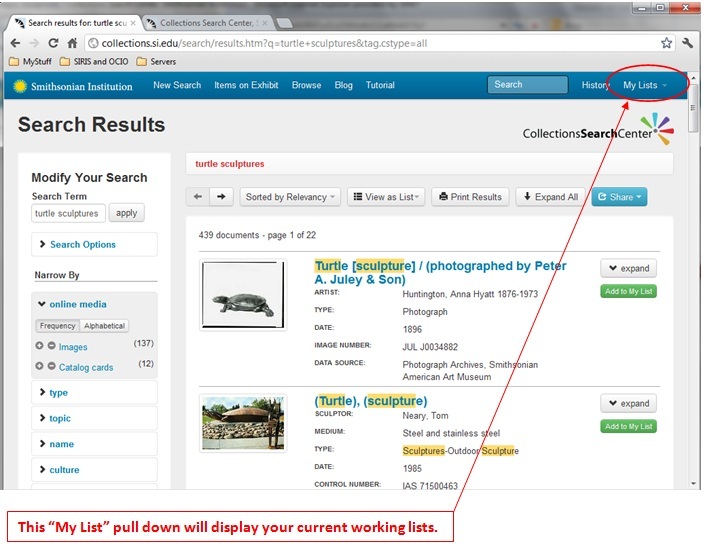 Use filters to narrow your search results. Apply Date narrow by in the left column, look for 1940s. Apply Date narrow by in the left column; look for the date range you desire. General Reference Category includes citation references of publications, art works, and other information that may or may not be owned by the Smithsonian. National Museum of Natural History - Botany Dept. National Museum of Natural History - Entomology Dept. National Museum of Natural History - Paleobiology Dept. National Museum of Natural History - Vertebrate Zoology - Birds Div. National Museum of Natural History - Vertebrate Zoology - Mammals Div. National Museum of Natural History - Vertebrate Zoology - Marine Mammals Div. National Museum of Natural History - Vertebrate Zoology - Fishes Div. National Museum of Natural History - Vertebrate Zoology - Herpetology Div. Use any of the options below to tailor your Search Results Display. Use any of the options below to tailor your Record Display. "My Lists" are a convenient way to collect records of interest. Create as many lists as you like. Email the list to yourself or others when you are done. The link inside the email will give you access to the list. Below are some pointers to get your started creating My Lists. Begin by searching for some records you want to put on a list. Click the "Add to My List" button on the search results screen. Enter a name for your list in the popup window. 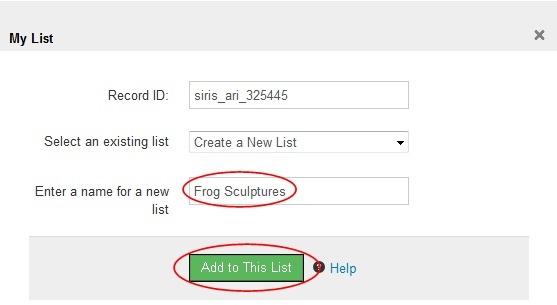 I entered "Frog Sculptures" in the text box. Click the "Add to This List" button. The "Success!" message is displayed and my list is created. Add as many records to the list as you want. At any time, you can email the list to yourself. 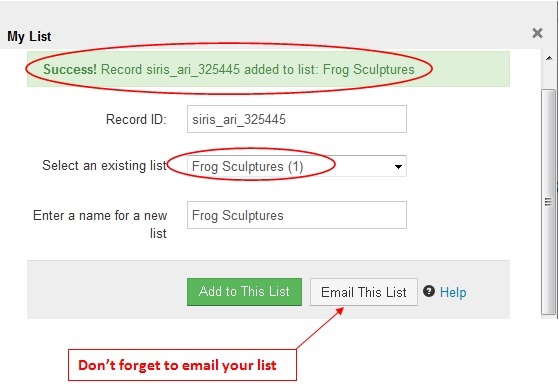 You can continue to add records to your list and there is no need to email the list again. To view all the lists you are working on use the "My List" button. This makes it easy to work on multiple lists at the same time.